The highly anticipated new Case IH Austoft 8000 series harvester builds on the renowned 7000 series with a host of added improvements to increase productivity, maximise uptime and reduce maintenance during harvest. The cab has been completely redesigned to include best-in-class visibility and sound levels. It also offers industry-leading technology to make operating the harvester easier and more efficient, according to Stuart Brown, Case IH Marketing Manager. 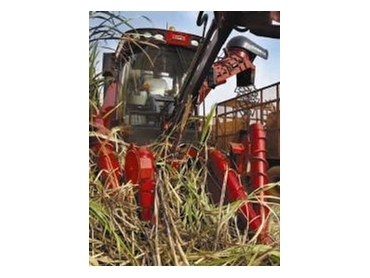 Technology innovations include the first factory-installed data logger available in a cane harvester. All 8000 series harvesters are fitted with software to monitor and record harvesting parameters, and can be linked to specific operators, fields and varieties. The information can be downloaded to a flash card, allowing farmers to review and refine their harvesting practices. The 8000 series harvesters are also AccuGuideTM ready. This means guidance can be controlled via a single monitor, and planting guidance patterns can be transferred to the harvester for simple operation. The 8000 series’ simplified mechanics deliver more power and productivity while minimising maintenance. For example, the new cooling package removes trash caught in the screen and ejects it away from the harvester, further reducing maintenance requirements.